New Construction, Large Commercial, Industrial, Heights above 25', Faux Finishing, Custom Staining, Wood Restoration, Paper Hanging. We're not jacks-of-all-trades...we specialize and focus on one thing, and do it "sehr gut" (pronounced "zair goot") - German for "very good"! 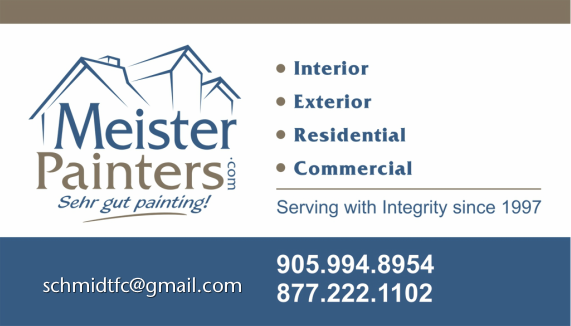 "Meister Painters" (pronounced "My-ster"), means, as you may have guessed, "Master Painters". Along with being a nod to our heritage, we like to think it highlights the skill and commitment that our small family of local painters will bring to your painting project - something that our hundreds of satisfied customers will attest to. We are fully insured and very price competitive; however, if you're shopping around for the cheapest price, then in all honesty, we're probably not the painting contractor for you. What we do promise you is full value for your dollar with excellent workmanship and products, friendliness and integrity, and a happy, stress-free experience that will have you recommending us to your friends and having us back again in the future! We service the Niagara and Hamilton regions, especially along the QEW/Red Hill corridor from Fort Erie to Ancaster. It's a larger area with many smaller and rural as well as urban communities, but whether you live around the corner or in the next town, our hard-working, locally-based painters always go the extra mile to give you a great paint job! We look forward to serving you, so call or email us with any questions or to request a Free Quote!